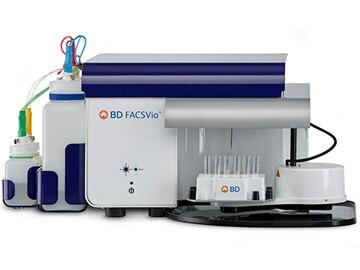 Rising costs, regulatory compliance, labor-intensive manual procedures, and aging technology–with BD FACSVia™ system, you get a powerful, easy-to-use benchtop system designed to ensure that your laboratory runs smoothly and efficiently. The BD FACSVia system provides accuracy, repeatability, and ease-of-use–along with low cost of operation–from a system that combines space-saving innovations in optics, fluidics, electronics, and miniaturization. Designed to improve lab efficiency and reduce manual steps, the BD FACSVia helps you do more with less. BD FACSVia simplifies workflows by combining space-saving innovations in optics and fluidics with an intuitive user interface.